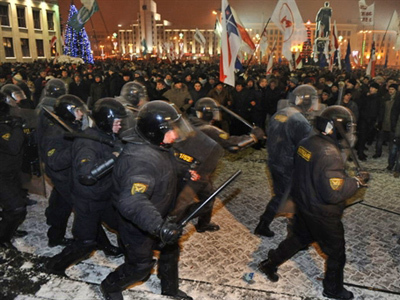 Belarus security services have revealed the names of three main “provocateurs” who they claim are responsible for the organization of post-election protests in Belarus on December 19 last year. ­They said the investigation into the disturbances is now over. Vitaly Matsukevich, Aleksey Sherstov and Denis Guseltsev acknowledged their guilt, saying they were the first to call for violence. “Investigators now have irrefutable proof, including evidence by eye-witnesses and the defendants, photos and videos, which confirm that these persons were among the first to call for the storming of the government HQ,” the State Security Committee stated. 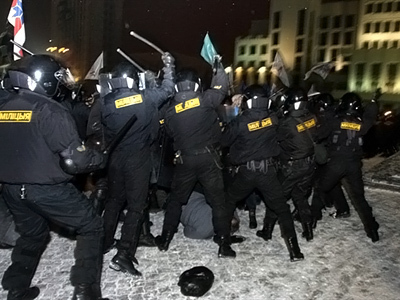 Their confessions were shown on all Belarus TV channels paired with camera shots on which the young residents of Minsk are seen on the steps of the government building shouting, “Belorusians, here!”. The three claimed that they were urged to protest by presidential candidates Nikolay Statkevich and Andrey Sannikov. “Matsukevich, Guseltsev and I climbed the steps of the government HQ. We were urging people to storm the building. Several of them then approached the building and started breaking the windows,” Sherstov recalled. “Some time later, the presidential candidates organized the crowd into an improvised corridor and passed to the government building entrance, which prompted another wave of the storm,” he continued. 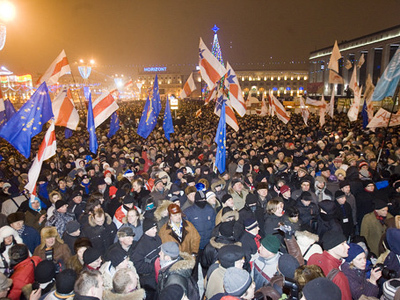 Mass protests in central Minsk followed the presidential election which brought a landslide victory to President Aleksandr Lukashenko. Opposition leaders have not acknowledged the results pointing to a series of grave violations and falsifications. Police detained or arrested hundreds of protestors back on December 19, including presidential candidates, other opposition leaders, and journalists, who were charged with either organizing or inflaming mass disorder. The State Security Committee pointed out that Matsukevich, Sherstov and Guseltsev are former classmates living in the same district, which overturns “allegations of some opposition media” that the disturbances were provoked by the security services themselves. However, local observers are skeptical about the conclusion. First, opposition members say they know nothing about the young men. Second, the videos show that police paid no attention to the three while detaining dozens of ordinary passer-by.